It is officially spring! In our front garden the daffodils are out in their splendour. They make me happy even if I am yelling at the kids to run as we have set out late for school. The temperature is getting warmer and we seem to have said goodbye to winter. Well now I have said that you can guarantee the snow will arrive next week, but I am holding onto the sunshine that we saw last week and hoping for the spring-like conditions to stay! In my head the only bad thing about spring is the fact that we lose an hour of sleep when British Summer Time begins! 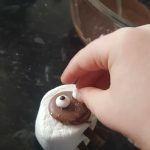 I have been thinking about making these sheep since Christmas when I was thinking how the kids and I could make the nativity scene out of food items. Unfortunately, I only really got as far as the sheep and then ran out of time to think of more ideas and execute them before Christmas. It may well be on the list for this Christmas, but as usual it depends on time and if I can take precious time away from making mince pies and Christmas cake! I was then racking my brain to see when I could appropriately make them and it occurred to me that new lambs traditionally mark the beginning of spring so there we go! A start of spring activity instead then! 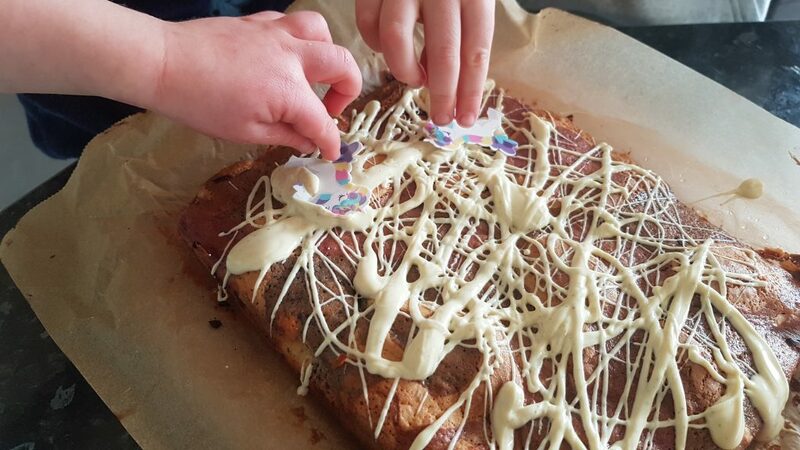 As this was a super quick Saturday morning baking in pyjamas activity, I decided to use the opportunity to get the boys, Atticus in particular, to practise their handwriting skills. 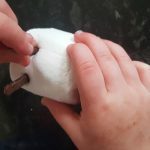 I find he is more eager to have a go at writing something when it is fun and these sheep and more specifically the promise that he could have one for snack time really spurred him on to have a go. I must say I am super proud of his efforts. 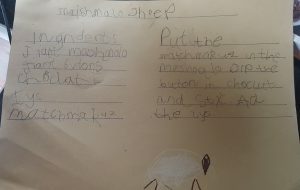 His teacher is always advocating him having a go at writing something about something that interested him or that he enjoyed so this certainly fit the bill. A pyramid of sheep drying! Grown up cut each Matchmaker into four for legs. Push each leg into the bottom of the marshmallow. You will need to push it in quite far for it to work. Some of ours didn’t stand properly, but most did. It is all a matter of making them even. Put the sheep on its bottom and coat the back (with a spoon or by dipping although the latter is messier in this case!) 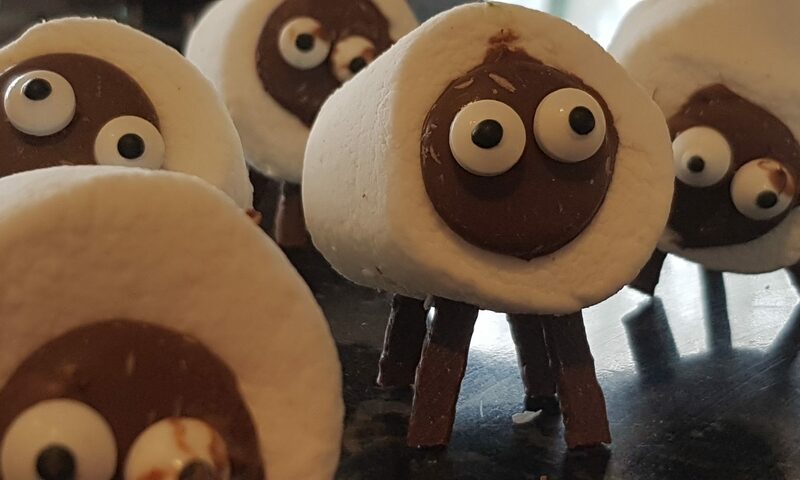 of the chocolate button in melted chocolate and stick to the sheep’s face. Put a tiny bit of chocolate on each eye and stick to the chocolate button. 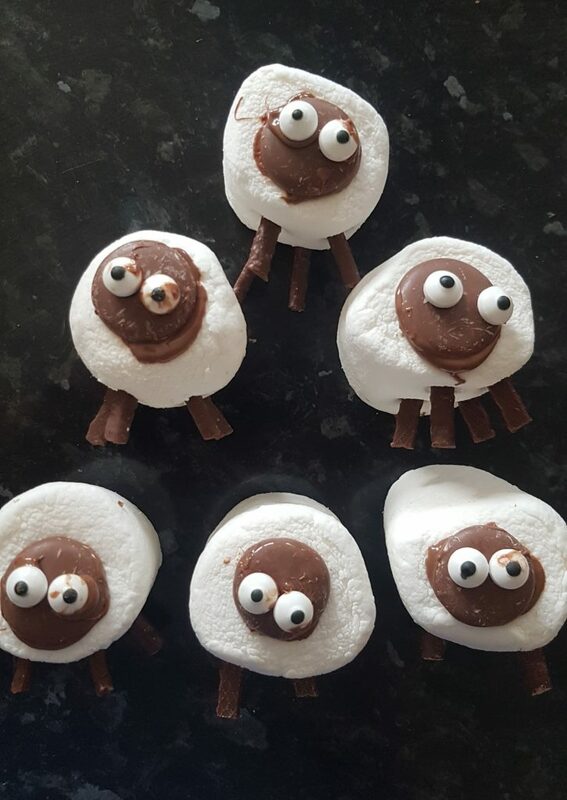 Leave the sheep on their bottoms (so chocolate button facing upwards) until the melted chocolate has set so they don’t move around. 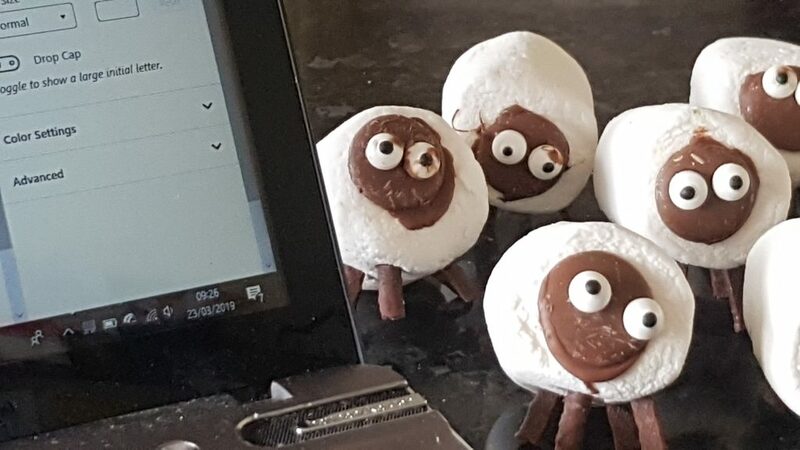 My kids are now waiting to be allowed to eat one of these sheep. I am quite enjoying having an ovine (yes the adjective for sheep is ovine in case you didn’t know) audience as I write this up for you all. Please do send me pictures of your sheep if you do make some! Transporting the crab from the mixing bowl to our large ramekin. Squishing the piece of lime. 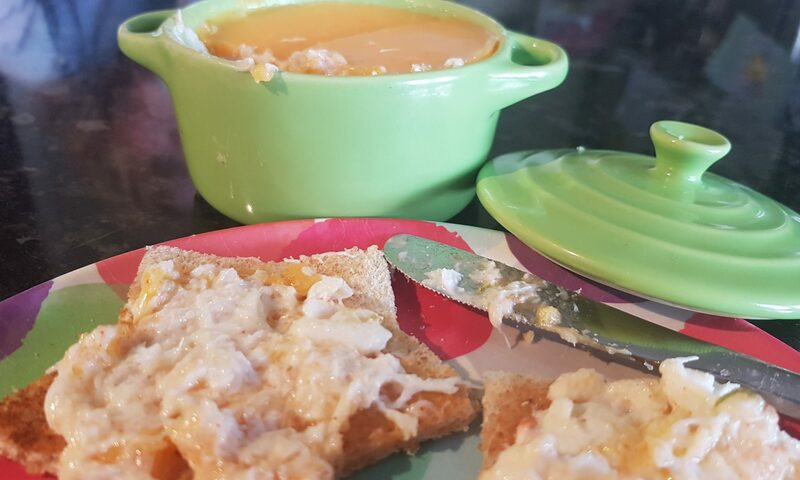 You may be rather sceptical when you learn that I made potted crab with my 2 year old. 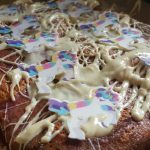 I encourage you to read on despite any misgivings as this really was a fun recipe to make with her. 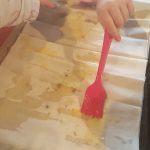 She had fun counting out the tablespoons of yoghurt and squishing the slice of lime, twisting the salt and pepper mills, mixing, transporting and pouring – lots of activities which are present on early years schemas. It also allowed me to introduce a fish with a different texture to her and hopefully encourage her to widen her pallet when she is older. She wasn’t a huge fan, but I remain undeterred as tastes change as children get older and the boys did enjoy it. 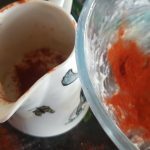 When Ophelia went ‘shaky shaky’ with the paprika! 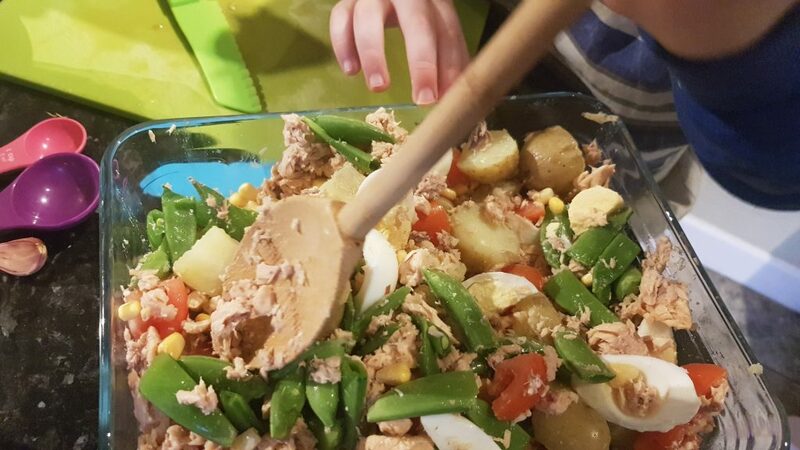 This recipe could be managed solo by an older child, but Ophelia did need some encouragement to stay on task and not go ‘shaky shaky’ with the paprika or try and eat the rest of the lime. I managed to prevent the latter, but was unfortunately completely incompetent at the former… More vigilance was required and in this instance I was lacking! I would also be lying if I said that I managed to remain completely calm… What this picture doesn’t show is the rest of the kitchen counter! Time to pour the melted butter on top of the crab. 1 tin of white crabmeat, drained. 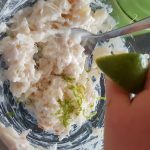 Recipes for potted crab generally call for fresh crabmeat, but as this was for making with kids we opted for tinned crab and the result was delicious. Put the crabmeat into a bowl and count in the tablespoons of Greek-style natural yoghurt. Add the lime zest, juice and seasoning and mix well. We used a tub grater with the fine grater attachment to zest the lime. Spoon the mixture into a shallow dish, one large ramekin or two smaller ramekins and gently flatten. Add the paprika to the melted butter and mix. Pour the melted butter over the ramekin(s) and refrigerate until set. This will take around 30 minutes. Remove from the fridge around 30 minutes before serving to make it easier to spread. 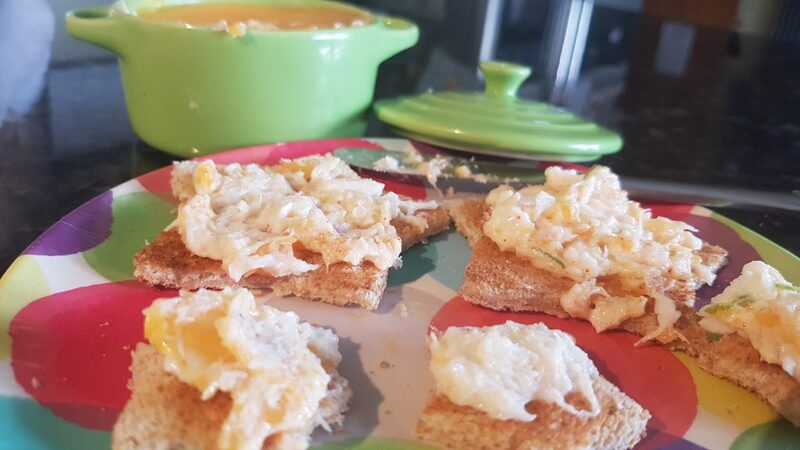 Enjoy with toast, crackers or crumpets. Remember to remove from the fridge around half an hour before you want to spread it. The boys enjoyed this in sandwiches. 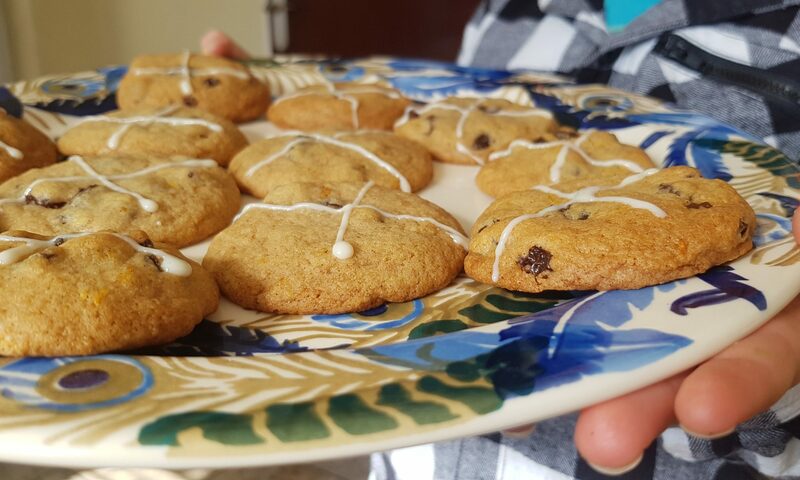 I find baking therapeutic. 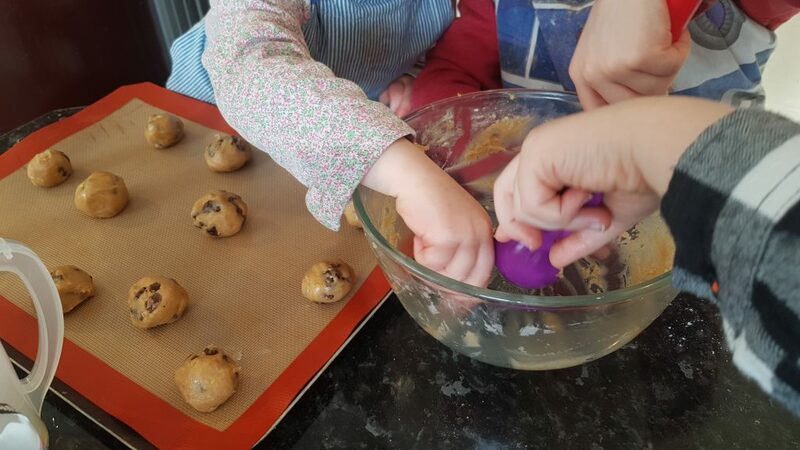 I even find baking with children relatively therapeutic. This is especially true when the alternative is a 20-minute argument about what board game they should play or TV show they should watch or a meltdown because one little Gilbert didn’t listen to any other little Gilbert’s ideas. The reason for this is generally because any argument can be solved by licking the bowl or by consuming copious amounts of leftover melted chocolate. 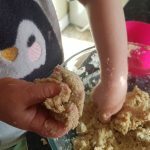 Yes there are times when the melted butter pot gets knocked over or the flour manages to escape out of the packet and everyone swears they didn’t touch it, but the good in it definitely outweighs the bad and most of the time I get through the activity with my frazzled temper relatively intact! 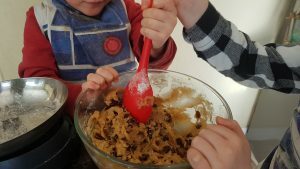 Disclosure; I would like to remind my lovely readers that the more children you try to cook with, the more stressful the undertaking for the ‘responsible’ adult. 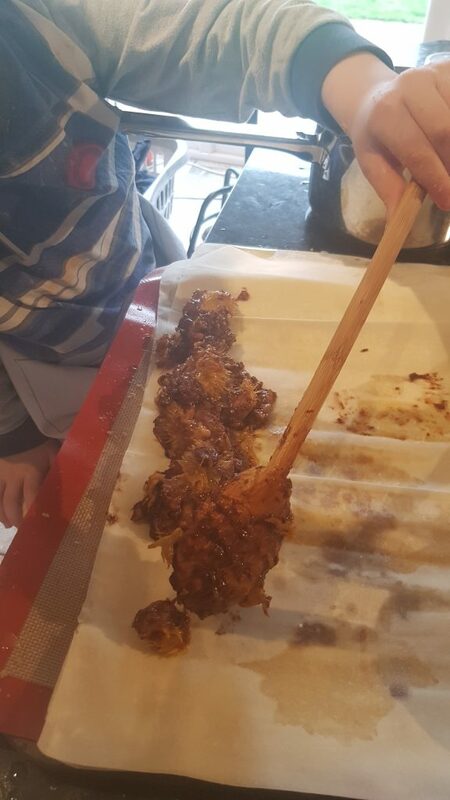 As a mum who has been cooking with little people for around 5 years, if you manage to get through the planned recipe with no mistakes or cross words I salute you! You deserve all the chocolate! When I managed to decorate without the children! These squares were initially mummy-daughter baking time. The boys didn’t participate as they had agreed on a game and were tearing around the garden completely immersed in their imaginations (completely lovely to see especially seeing as it was a rather rotten day). But as is so often true, two is company and three a crowd so Ophelia was at a loose end. 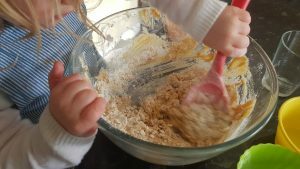 And as it is a darn sight easier to cook with just one child rather than my whole tribe, I enjoyed this time with just her and she seemed to enjoy having me completely to herself! 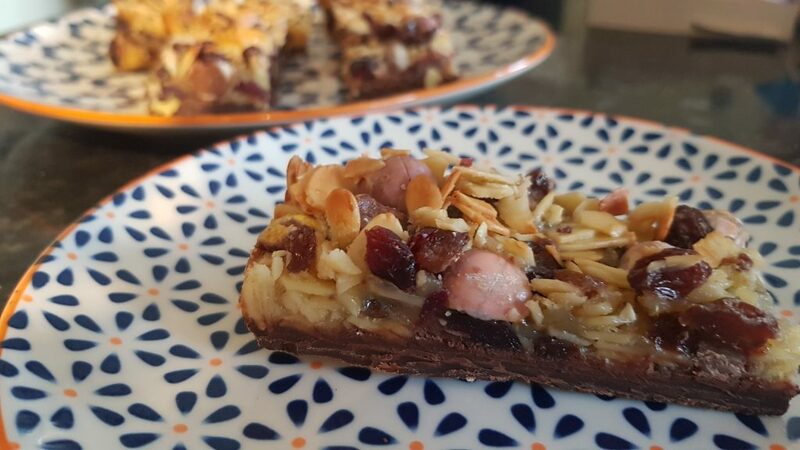 This recipe makes a thin biscuit bar coated in chocolate. Don’t be tempted to place it in a smaller tin for a thicker biscuit. 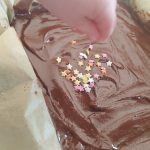 It will fit in a brownie pan when spread out thinly – your little chef may need a bit of help to achieve this. 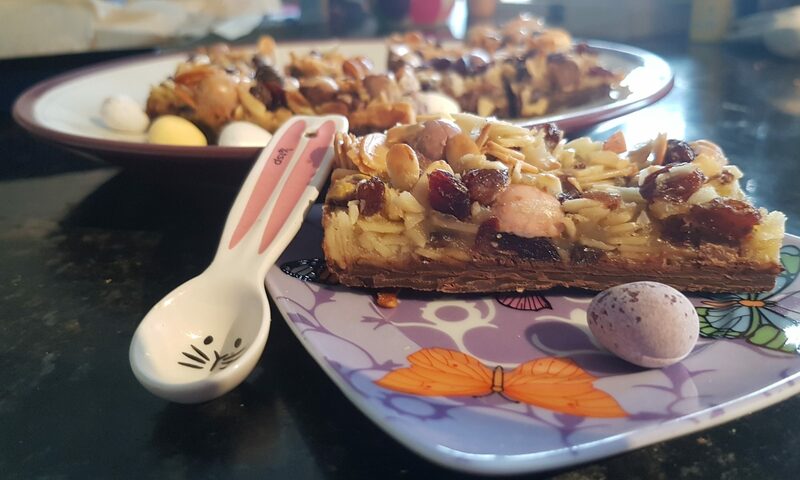 If you are making these bars with small children I recommend using more chocolate to coat them as it is easier to spread a thicker layer of chocolate than a thin one to ensure that the top of the bar doesn’t get damaged. I think these are yummy with desiccated coconut or chopped almonds on the top. 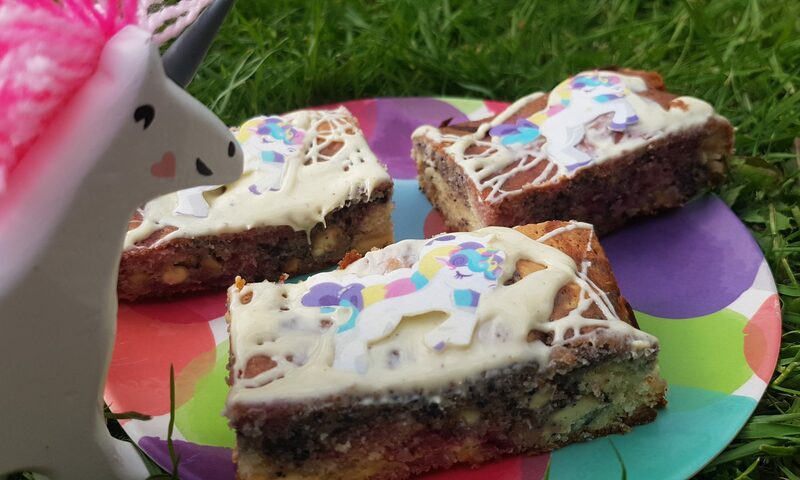 Unsurprisingly, Ophelia prefers them with sprinkles – the pinker the better! You will see that she and I compromised and both coconut and multi-coloured stars to decorate one of the batches. The concentration level was immense! Preheat the oven to 180°c fan and grease a brownie pan with a silicone baking brush and line it with greaseproof paper. 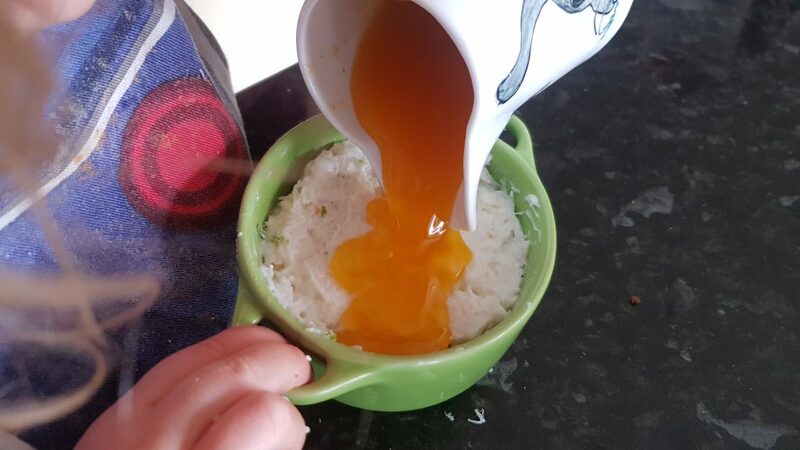 Put the margarine, sugar and egg yolk into a bowl and mix until smooth, pale and creamy. 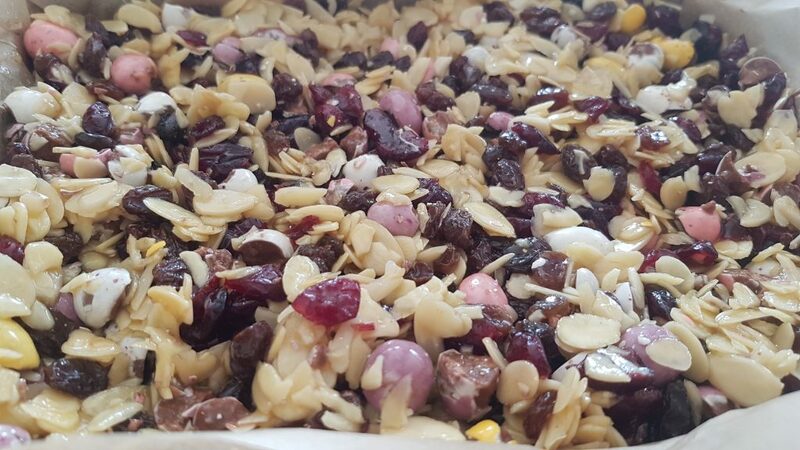 Sift in the flour and add the oats and gently mix them in. Carefully spread in the brownie tin (adult help may be required here) and cook for 15-20 minutes until golden. Remove from the oven and melt the chocolate and margarine. 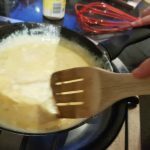 This can be done in a double boiler on the stove or in the microwave. If you are using the microwave, melt it in short bursts on medium power, ensuring you mix it frequently. Pour the chocolate over the biscuit base (the tin will probably still be hot, so carefully) and spread with a silicone spatula. Decorate with your toppings of choice. Cut into squares while still warm and then leave in the tin until they have completely cooled. The compromise: sprinkles and desiccated coconut! 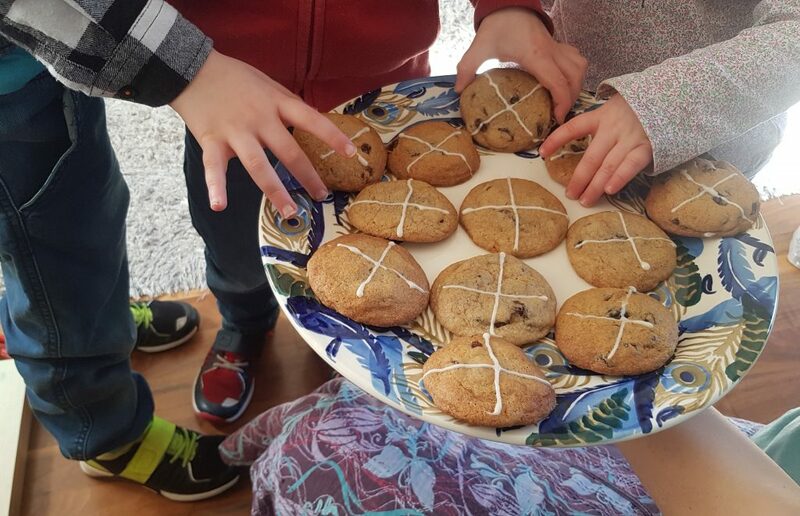 Every time these are made I am surprised when they survive the night as I am always worried I may decide to sneak down stairs and devour the whole batch before the children wake! Do get in contact if you make these and let me know what you think. Apologies for my lack of posts in the last week. I am undergoing a period of adjustment and for a creature of habit, it is hard to accept change. I find myself I torn between delight and the feeling that it is the beginning of the end. The reason for my current inability to decipher my own emotions is because my youngest, my baby, has started nursery. While it is true that for the time being she will only be going one morning a week, it seems to herald the true beginning of the end of my period as a full-time stay-at-home-mum. I am not quite yet rushing back into work, but I need to get my thinking cap on vis-à-vis paid employment and what I plan to do with my time. I wish that I possessed the ability to be truly decisive, but I am not ready for this new independent stage which I can no longer deny is occurring in my not so little littilest. 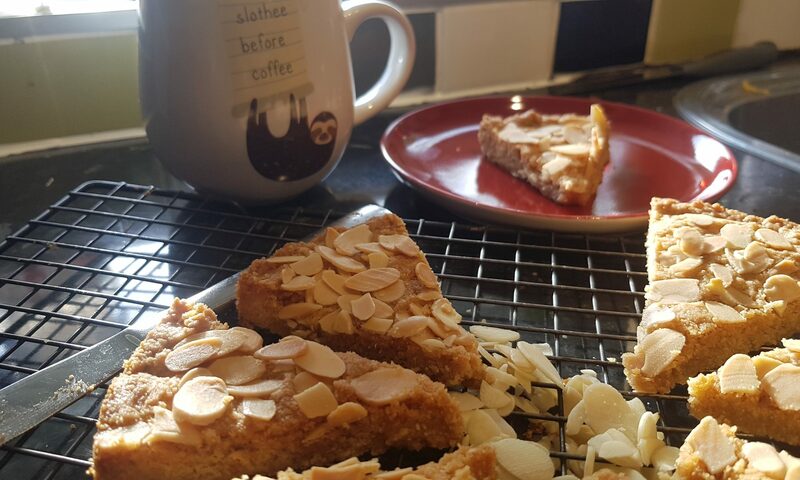 So instead of researching what my next step should be, I thought I would tell you about the almond shortbread that Ophelia and I made together as the memory of making this with her makes me smile. Gently press the almond in. 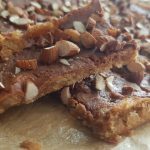 I don’t know about you, but I really love the depth of flavour and the texture that ground almonds bring to baking. 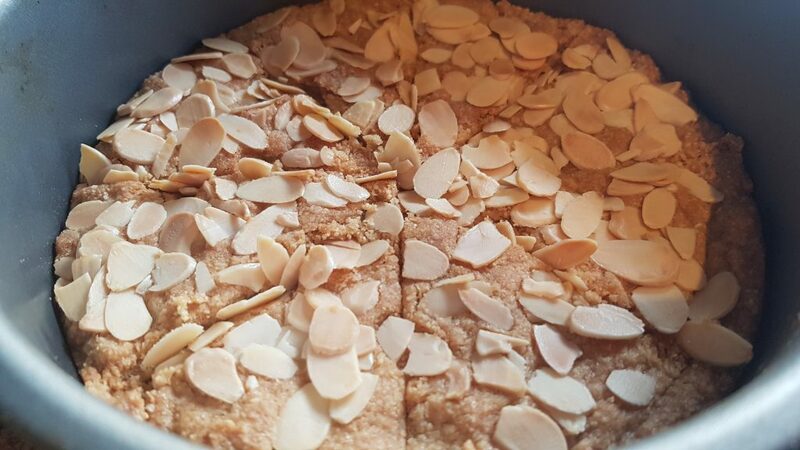 We made this shortbread in a circular tin and adorned it with flaked almonds. 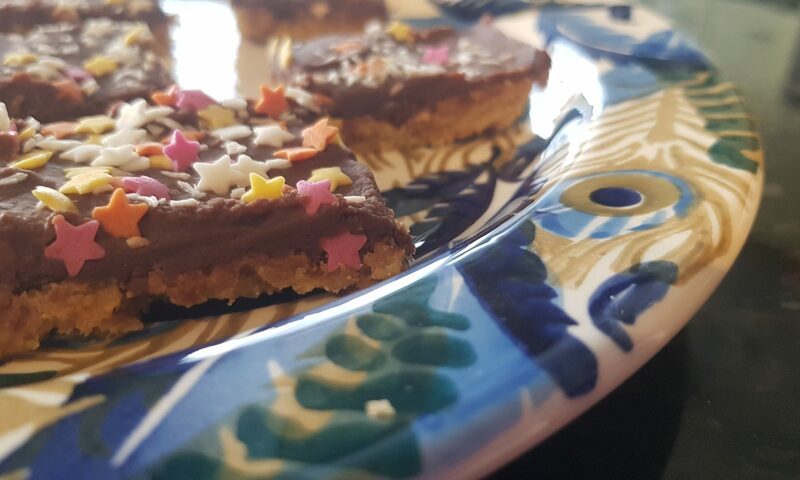 It was a yummy, nutty shortbread which the kids absolutely loved. 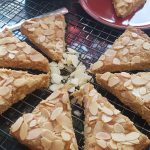 Yes, it is more crumbly that traditional shortbread, but I think the almonds make it special and truly yummy. The aroma of this shortbread filled the kitchen for quite a while. It was such a temptation to eat it warm, but do let it cool fully in the tin as it has a very crumbly texture. 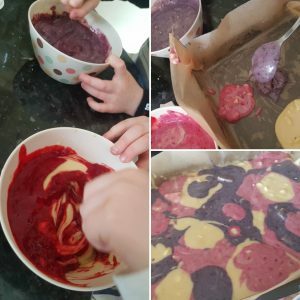 Paint the baking tin (we used a 20cm circular one, you could use a square one or even a loaf tin). Mix the sugar and the flour. 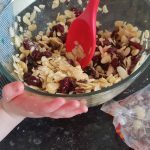 Next add the ground almonds and bring together with your hands. The texture will be a bit grainy due to the ground almonds. Place in a tin and pat it down until flat and score out your pieces. Gently press the flaked almonds on the top of the shortbread. Bake for 25-30 minutes until firm to the touch and golden brown. Gently complete the slices while warm and leave to cool fully in the tin before removing it. 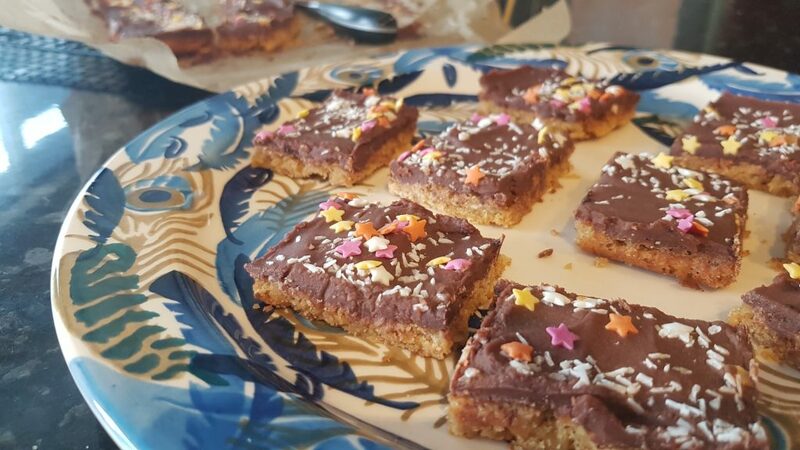 This shortbread was the perfect accompaniment to a calm afternoon cup of coffee. The kids also enjoyed munching on this on our walk home from school. I was rather sad when it was no more, but as it is really very simple to make it really isn’t a problem or a hardship to make another batch! 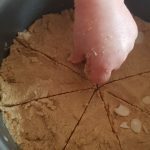 I hope you enjoy this recipe and do let me know if you make it. What to do with the leftovers from a filo pastry packet! Do you ever buy a packet of Filo pastry and use only a small amount of it only to be left what you are going to do with the rest of the packet?! Maybe it is just me. I made a Slimming World friendly pie for Simon and my mum and it only called for one sheet of Filo pastry. 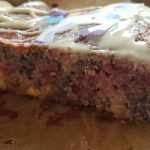 So I decided the kids and I would use the rest in a sweet recipe. As they are often reluctant to try crumble and recipes with stewed fruit (please read here, wouldn’t touch stewed fruit with a barge pole) I decided to try and alter the texture of the cooked fruit with masses of crushed bourbon biscuits, and a couple of tablespoons of Sweet Freedom Spiced Orange Choc Shot. The kitchen smelt amazing while we had this on the stove! I would have happily eaten the oranges, crushed biscuits and Choc Shot mixture straight from the pan. I was instead on my best behaviour as Seb was in charge of the pan and I didn’t want to be admonished by a six year old! Orange slicing in full swing. 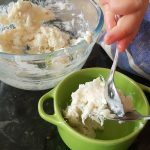 This recipe was so much fun to make; the kids had fun crushing biscuits and painting the filo pastry with melted butter. It’s true that the filo pasty sheets are fragile and they did need help moving single sheets before painting them, but we didn’t have any major mishaps! Also we put the melted butter in a wider based bowl than the last time we worked with filo pastry so I didn’t have any melted butter to clear up! Preheat the oven to 200°c and put a silicone baking sheet on a baking tray. 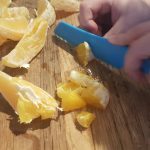 Slice the oranges into bite-sized pieces, bash the walnuts and crush the chocolate biscuits. Put a couple of tbsp. of melted butter into a saucepan and add the oranges over a low heat. 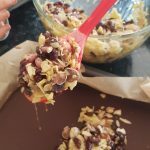 Add the walnuts, crushed biscuits and the Choc Shot and mix all well. You should have a sticky chocolatey mess. It should be thick and not runny. 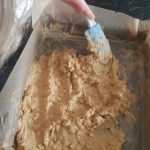 Lay a single sheet of filo pastry on the silicone baking mat and paint with melted butter and add a sprinkling of the muscovado sugar. Add another sheet of filo pastry and repeat step five. 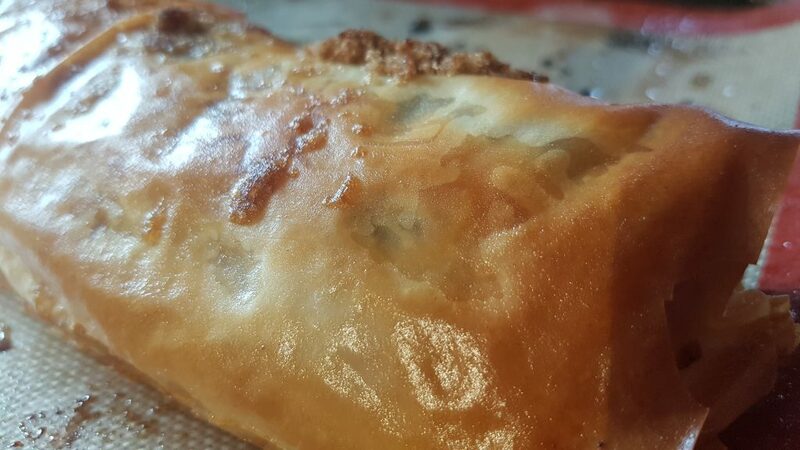 Continue until you have used all the sheets of filo pastry. Place the filling down one long side of the pastry and roll it up to make a long sausage, tucking the ends in as you role (I did this bit). 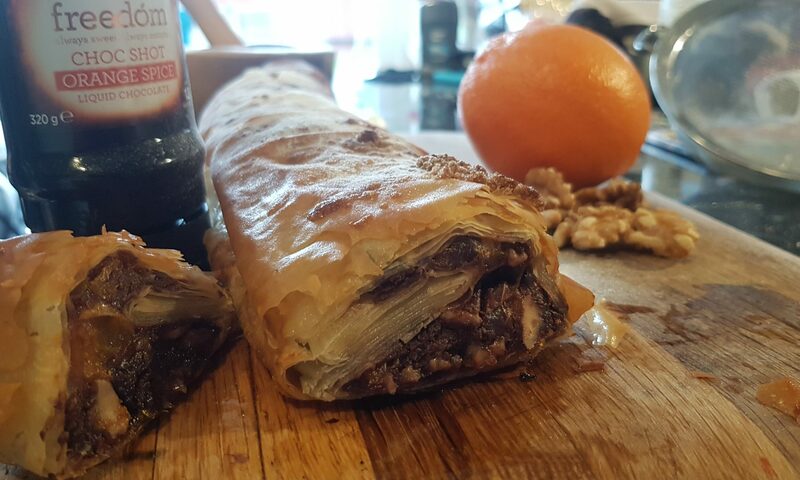 Ensure the strudel is seam-side down and brush with melted butter and the remaining muscovado sugar. Bake in the oven for 35-40 minutes until golden and crisp and the pastry is cooked through. Leave to cool for 10-15 minutes before sprinkling with icing sugar and serving with ice cream and/or more Choc Shot. 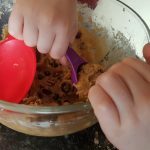 Two out of the three kids loved this recipe so I am counting it as a win. I thought it was yummy and would have happily scoffed the whole strudel all by myself. 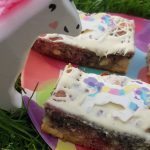 The only thing that stopped me is that I had had quite a cake-heavy day and I really thought I should lay off more sweet treats or I would have had a sugar rush all night! 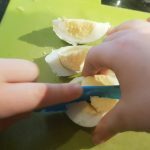 Slicing hard boiled eggs and taking about fractions. I am sure I have already said so before, but if there is a request to help in the kitchen, it is always granted no matter how inconvenient it may be at the time. This does mean that some evenings dinner is ready a lot later than originally planned or even the latter – too early as they didn’t want to help! It has to be said though, sometimes asking them for help can lead to them not wanting to. 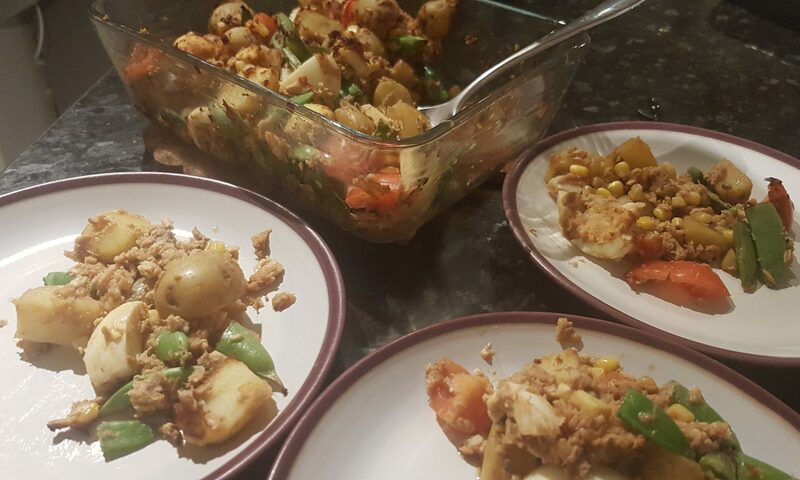 I have learnt that if I start making the food using their colourful knives and doing things they like such as chopping vegetables, cracking eggs, whisking and mixing they become eager to help and argue over whose turn it is next! 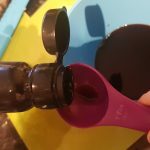 Measuring out the soy sauce. There was an intense look of concentration on his face as he completed this task! We didn’t have any such scenario for this time around. This is because Seb has recently been invested into our local Beaver colony. He will tell anyone who will listen (including complete strangers) that he is a Beaver with a necker and woggle. This statement is sometimes met with looks of confusion, but most people who have had some contact with the Scouting or Guiding movement will show what he deems to be an appropriate response. I quickly realised that there is a cooks badge and I asked him if he wanted to make some items towards it. He was even more eager than I could have anticipated! This meal was eaten by the whole family and was entirely put together by Seb. There is a small amount of adult preparation. You could use tinned potatoes if you want to reduce the amount of adult preparation. We used tinned salmon, but you could cook some pieces of salmon instead. We also were able to use this activity to reinforce Seb’s understanding of whole, half and quarter as he quartered the boiled eggs. 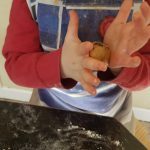 I completely love it when cooking can help with multiple areas of the curriculum! Time to mix it all around! Boil the new potatoes for 15-20 minutes, drain and leave cool. Gentle lower the eggs into boiling water and simmer for 8-10 minutes. Run under cold water and remove shells. 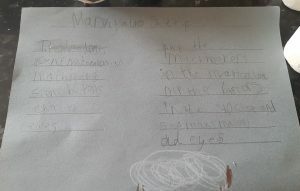 Older children could do all of the above, but as Seb was making this after school I did the three above steps for him. Preheat the oven to 170°c and spray a large oven proof (we used Pyrex) dish with Frylight. Cut the potatoes, sugar snap peas and tomatoes into small pieces and add the large oven proof dish. Cut the eggs into quarters and add to the dish. Remove the salmon from the tins and gently squish with a fork to separate and add to the dish. In a small bowl, measure out the 8tbsp of soy sauce. 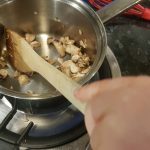 Gently bash the garlic cloves with a rolling pin and remove the skin and then crush with a garlic press. Add to the soy sauce. Mix the ginger and garlic into the soy sauce and pour over the dish with the rest of the ingredients and gently mix. Place in the oven for 20 minutes. Remove from the oven and serve immediately. Simon and I really enjoyed this dish. Seb wasn’t keen on the tomatoes, but in fairness he never is. Our little potato-hater managed to eat at least one new potato, but was adamant that he would not eat any more. As usual Ophelia managed to eat pretty much her whole portion. It was a nice family meal and one I am eager to repeat. Do get in contact if you make this as we would love to hear from you! My family has never had a particular tradition or connection to one particular sport. When growing up, my dad would always, I mean without fail, watch the Grand Prix. But it was never a family activity. I believe it was a source of mild frustration for my dad that neither of his daughters showed any interest in watching the motor racing with him. As a teenager, I remember looking forward to Grand Prix weekends as it meant I could have a Sunday afternoon to myself as long as dad wasn’t disturbed! I always knew that my husband was a rugby fan; when I first met him he was wearing a Leicester Tigers rugby shirt. Although, if truth be told, I would have been hard pushed to tell you that! Before we were married, it was very easy for me to avoid watching the rugby with him and make other plans. However, when we married, I realised that I wouldn’t be able to avoid the game my entire life. So I set about trying to understand the rules. I asked many, many questions. It may have actually been the same question over and over again and after over 10 years of marriage I am somewhat ashamed to admit my understanding of the rules hasn’t progressed! Ready to fill the wraps. Seb with his wrap shortly before it was demolished! My interest in understanding rugby was dwindling and then Simon told me that the 2011 Rugby World Cup was taking place in New Zealand. He asked me if I would like to watch the matches with him. I was rather reluctant as they would all be taking place rather early and although I am an early bird, I like my time to myself in the mornings. He promised me he would make me breakfast and a deal was struck. This was when what were initially called Rugby Sandwiches were created. 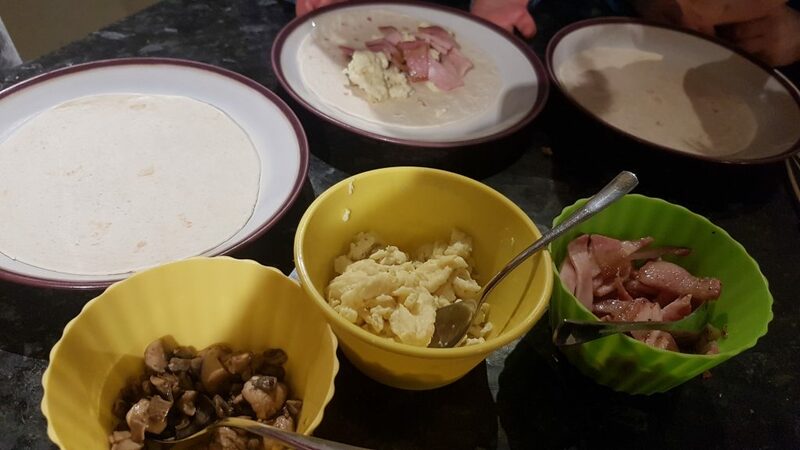 In their original form, we used partially baked baguettes filled with a combination of scrambled eggs, bacon and sausage and mushrooms. I had mine with vegetarian sausages. Fast forward to the present day (and the airing of the Six Nations 2019) and we are still making these. 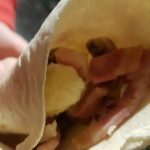 We have exchanged the partially baked baguettes for wraps as the kids eat them better and they work well if you are following Slimming World! Isn’t it funny how life changes?! 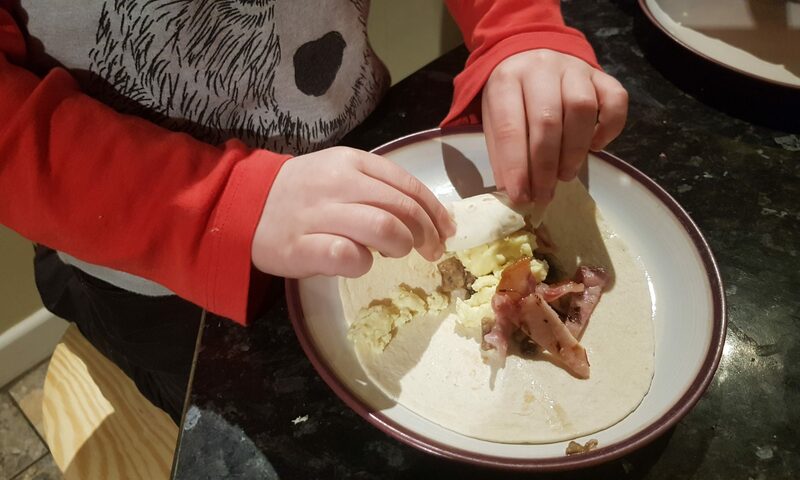 I was really impressed with my six year old during this process as he scrambled the eggs himself and kept an eye on the mushrooms and mixing them around while I sorted the bacon. He was so very proud of his efforts, and proudly told his dad how he cooked the eggs and the mushrooms! 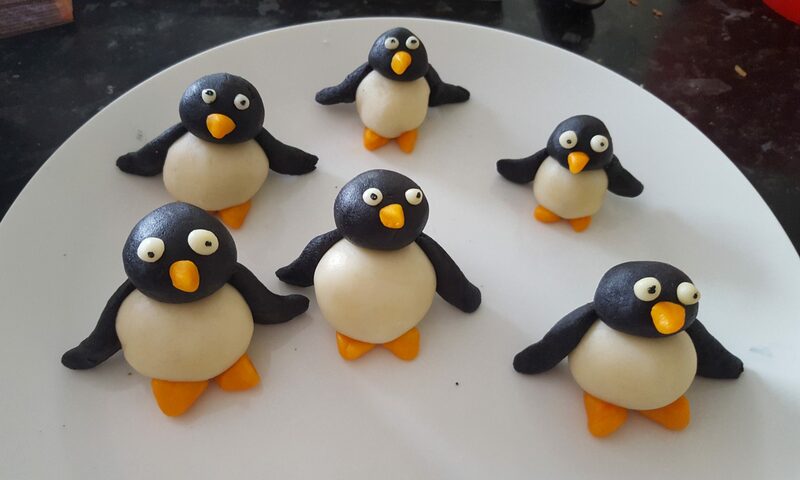 The kids demolished a couple of mini wraps each and the grown ups had these with potato wedges. Everyone was rather happy! Chop the mushrooms and put to one side. Put the bacon onto grill. Spray a small saucepan with Butter Frylight and add the mushrooms to fry. Mix every so often to stop them sticking. Spray another small saucepan or frying pan with Butter Frylight and pour the beaten eggs into it. As the egg starts to set, mix it all around until the egg is fully cooked. Put the cooked mushrooms and scrambled eggs into individual little bowls with spoons to serve. Cut up the grilled bacon and place in another bowl. 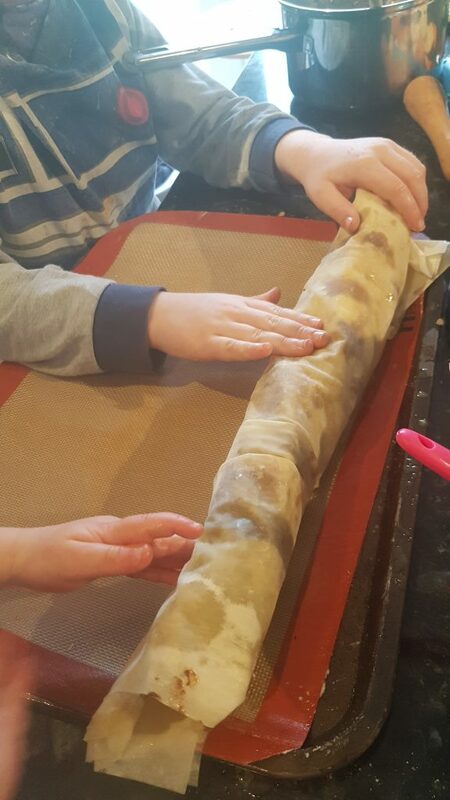 Give everyone a wrap on a plate and allow them to spoon in the fillings they want and roll up. If you are not eating them immediately, putting a cocktail stick in the keeps them wrapped. Enjoy in front of the rugby!